Because Special Collections is the home of the University Archives (UA), documenting the University’s history is central to what we do. The University Archives is filled with official records from the institution itself, but the student experience is under-documented. This is woefully true in the case of black students. One of the goals of the Library is to change that, but that can’t happen without alumni themselves. One such student organization is the Eta Tau Chapter of Alpha Kappa Alpha Sorority, Incorporated. Alpha Kappa Alpha Sorority, Inc. is the first African American intercollegiate sorority, and it was founded at Howard University in Washington DC 110 years ago. The Eta Tau Chapter of Alpha Kappa Alpha Sorority, Inc. was chartered at Iowa State University/Drake University June 14, 1973. Anniversaries are reminders of how important it is to reflect upon one’s history and place at the university and the greater community. It is also an opportunity to solidify ones place in the official historical records, making it known and available for generations of students and researchers. Courtesy of Keena Thicklin, AKA 1993 Initiate and ISU Class of 1995. AIDS Awareness Program flyer, March 1994. Courtesy of Tasha Oakley, AKA Inititate and ISU Class of 1997. Photograph of Eta Tau Chapter members at a formal event, ca. 1995. Courtesy of Keena Thicklin, AKA 1993 Initiate and ISU Class of 1995. Iowa State Daily article, January 1993. Courtesy of Tasha Oakley, AKA Fall 1993 Initiate and ISU Class of 1997. Help us document the Black student experience at Iowa State University. If you have letters, photographs, diaries, scrapbooks, research papers, meeting minutes, clippings, flyers, audio, film, or video recordings from your time at ISU, please consider donating them to the University Archives. Bicycle Club, circa 1898. University Photographs, box (1644). This weekend, one of Iowa’s biggest events begins. No, not the Iowa State Fair (that’s in August). Rather, it’s that huge bicycle ride across the state, RAGBRAI. RAGBRAI is a statewide event run by the Des Moines Register that began in 1973. Bicycle enthusiasts have been at Iowa State University since, judging by this photograph, at least the turn of the 20th century. ISU has had a student cycling club for years, currently called the ISU Cycling Club (in the 1970s, it was the ISU Bicycle Club). 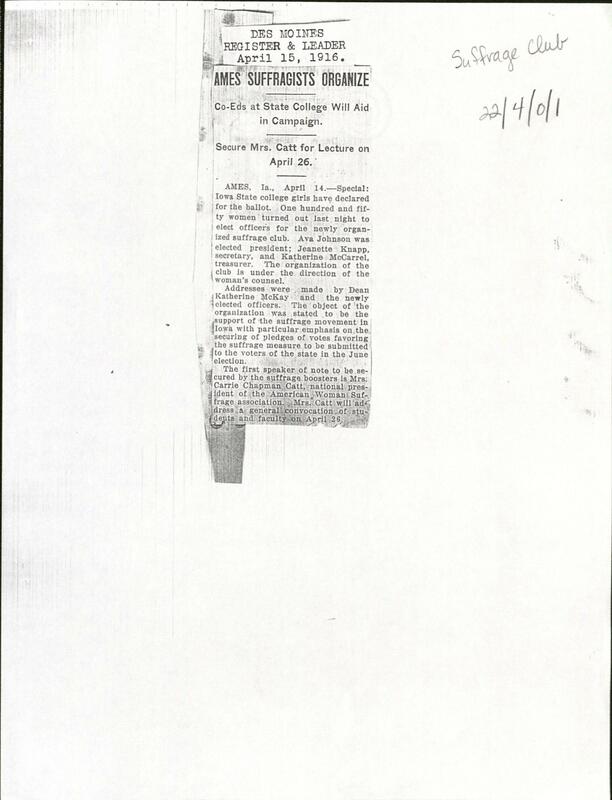 Some information on the ISU Bicycle Club in the 1970s is available in the Iowa State University, Student Organizations, Recreation and Special Interest Groups General File, RS 22/7/0/1. Stop by sometime! Alpha Zeta fraternity in front of Agricultural Hall (now named Catt Hall) on steps. This photograph was taken on May 23, 1927. Charles W. Burkett and John F. Cunningham, students in the College of Agriculture at the Ohio State University, founded the Fraternity of Alpha Zeta November 4, 1897. Alpha Zeta is a professional, service, and honorary agricultural fraternity for men and women in agriculture seeking to develop leadership skills to benefit agriculture, life sciences, and related fields. There are over 100,000 members worldwide. 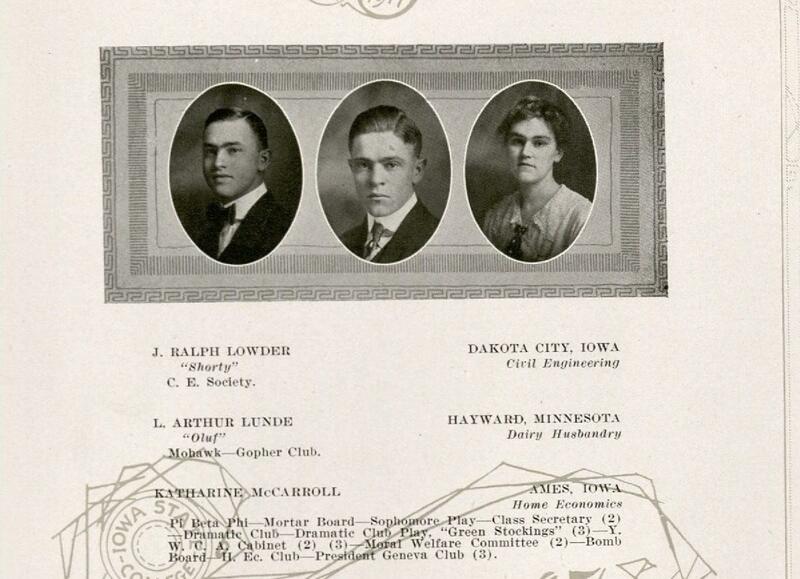 Drop by the reading room and review the Alpha Zeta Wilson Chapter (Iowa State University) Records. We’re open from 10 -4, Monday-Friday. June is LGBT Pride Month. 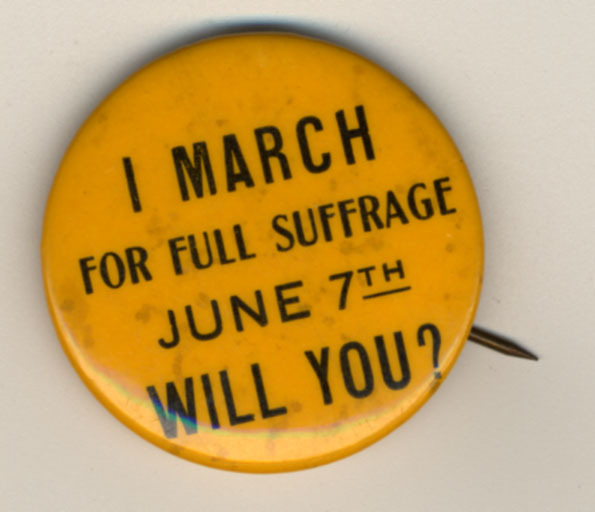 What better time to highlight LGBT-related materials in our collections? 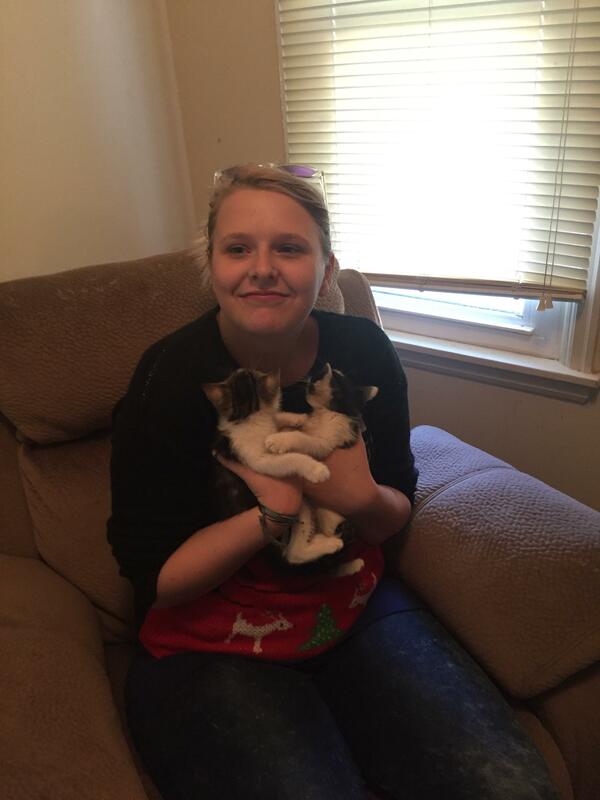 Iowa State University strives to provide an inclusive environment on campus, but it hasn’t always been easy. Homophobia was once rampant, not just on our campus, but everywhere. That’s not to say that it’s been eradicated, but overall there appears to be more acceptance today. In the face of the challenges LGBT individuals have faced, several student groups sprung up on campus in the 1970s. These included the Gay Liberation Front (later called the Gay Men’s Rap Group), the Lesbian Alliance, and the Gay People’s Liberation Alliance. 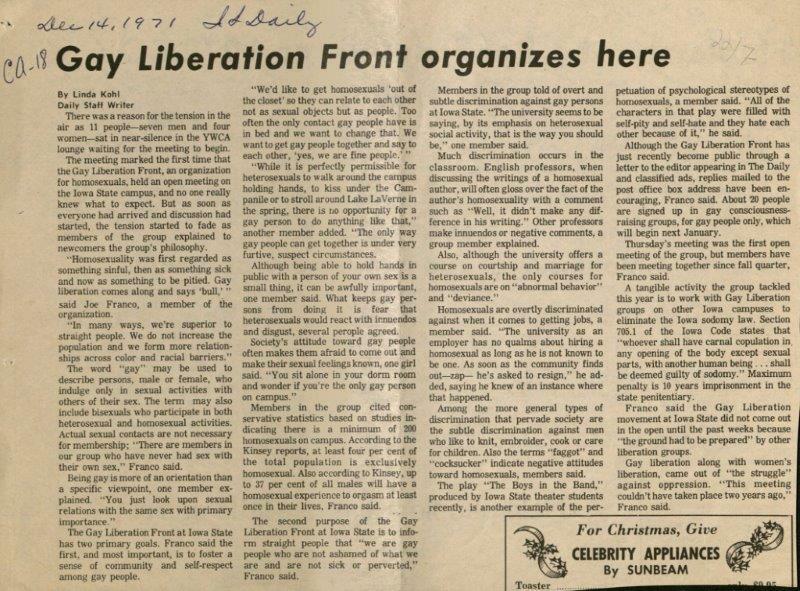 The first gay student group on campus was the Gay Liberation Front, established during the 1971-1972 academic year (it’s unclear if the ISU group was associated with the national GLF). The organization came together to start a gay liberation movement on campus and became publicly visible for the first time in December 1971, with a letter to the editor published in the Iowa State Daily in protest of the play “Boys in the Band,” which was being performed on campus. The letter complained of the production’s “outwardly homophobic attitudes toward the gay lifestyle.” (“30 Years Is Just the Beginning,” Iowa State Daily, April 1, 2002; RS 22/4/0/1, Box 1, Folder 34). Several response letters critical of the initial letter were sent and published. The following year, the group changed its name to the Gay Men’s Rap Group, a name with less of a political connotation. Membership increased drastically from the first year to the next, with around 25 people at the first meeting that second year. 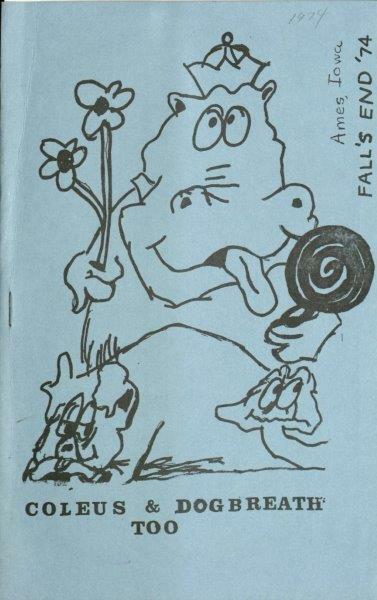 A founding member of the Gay Liberation Front, Dennis Brumm, wrote a history of the gay liberation movement at Iowa State on his website, a copy of which we have printed off from 2001 (note: the version in the link above is a bit different than the version in our archive). LGBT student organizations existing today on campus can be found on the Lesbian Gay Bisexual Transgender Student Services (LGBTSS) website, along with resources for LGBT individuals and allies. For more information on the history of LGBT organizations on campus, stop by and see the Iowa State University, Student Organizations, Political and Social Action Organizations Records, RS 22/4/0/1. We’d love to see you! Tonight Orchesis I, ISU’s modern dance company, presents Barjche, the company’s annual modern dance production. 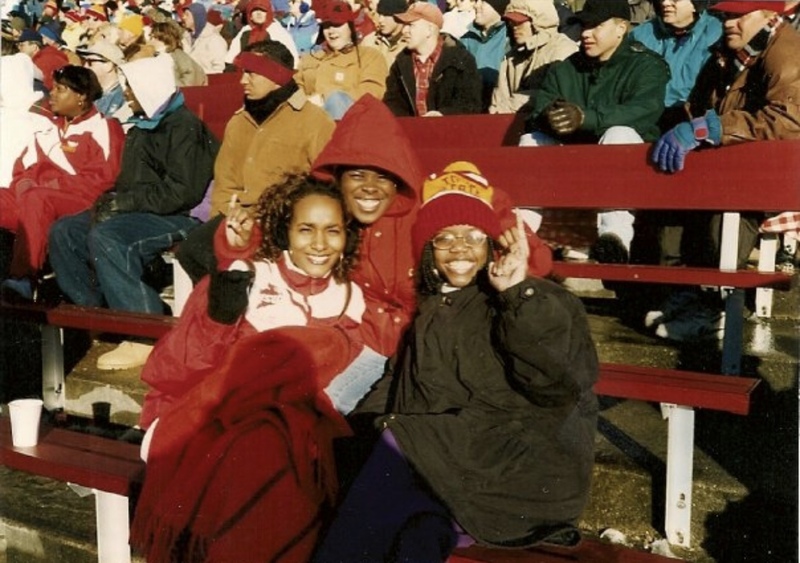 The performance has a long history at ISU. Let’s see what we can find in the archives about it, shall we? 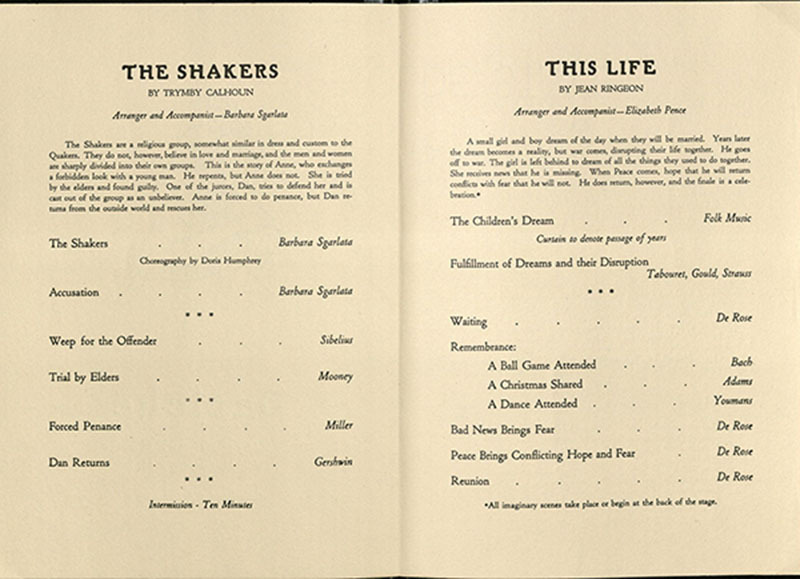 Program for first Barjche production in 1944. RS 10/7/3, Box 2, Folder 11. Inside of the program from the 1944 Barjche. RS 10/7/3, box 2, folder 11. Letter to the Editor of The Iowa Stater, May 1987. RS 10/7/51, Box 3, Folder3. “I was a better writer than a dancer, so Miss Moomaw [the club’s advisor] asked me to write a story line and she did the choreography for one of our big numbers. It was based on the Shaker religious group, and, of course, had all the drama that a strict religious theme could offer. Men and women were forbidden to have any contact with each other so we had a forbidden love story and a big tragic ending. It was great fun!” –Stickels, Trymby (Tim) Calhoun. 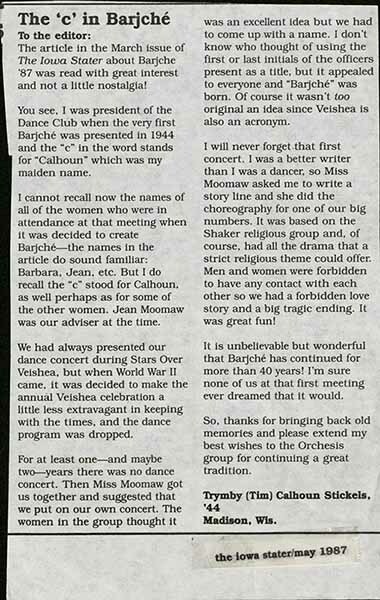 “The ‘c’ in Barjche.” The Iowa Stater May 1987: 9. Betty Toman, 1988. Betty Toman Papers, RS 10/7/51, box 4, folder 12. One person who has had a significant impact on Barjche is Betty Toman. Toman came to ISU in 1948 as a dance instructor and later became a professor in the Department of Physical Eduction. She served as Barjche’s director for 22 years, eventually expanding the production to include students from three departments: theater, dance, and music. In 1965, she took over advising the dance club, which became known as Orchesis. Orchesis I continues to produce Barjche today. Barjche production, 1967. University Photograph Collection, box 804. 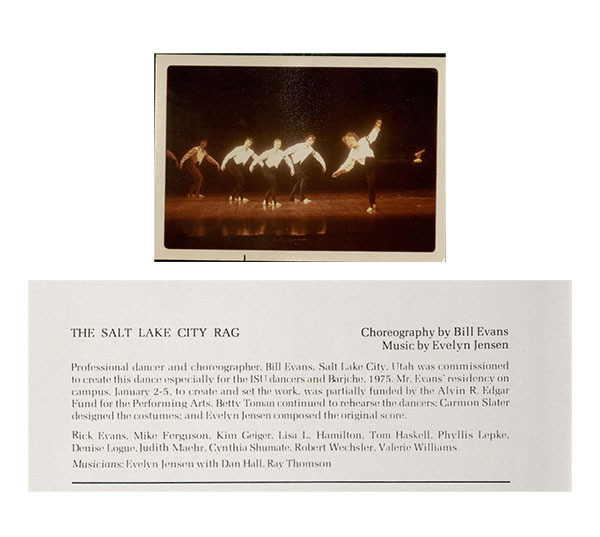 Photograph and program for “Salt Lake City Rag” by Bill Evans, 1975. From RS 10/7/3 and RS 10/7/51. 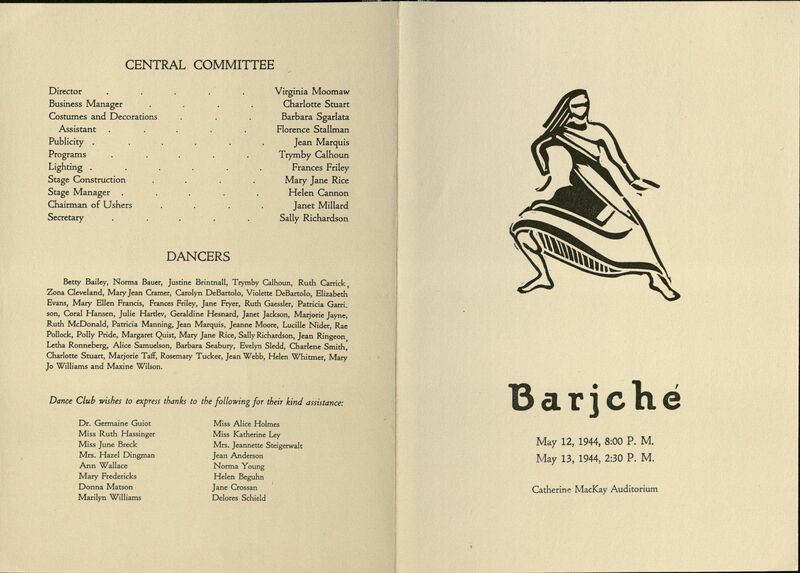 More information about Barjche and Orchesis I can be found in the Orchesis Records, RS 10/7/3, and in the Betty Toman Papers, RS 10/7/51. Stop by Special Collections to check them out! We are proud to announce that a large expansion of the Leo Charles Peters Papers (RS 11/10/51) is now available for research. Dr. Peters was a staple of the Iowa State University (ISU) Department of Mechanical Engineering from 1961 until his retirement in 1996. Born in Kansas, he got his start in engineering at Kansas State University with a B.S. in Agricultural Engineering (1953). Peters worked as an engineer for much of the 1950s at the John Deere Tractorworks in Waterloo, Iowa with the exception of the two years he spent in the 839th engineering battalion of the Special Category Army with Air Force during the Korean War. Peters left John Deere to take up a position as Instructor with the Department of Mechanical Engineering and complete his graduate education, earning both his M.S. (1963) and his Ph.D. (1967) in mechanical engineering and engineering mechanics from ISU. Peters was quickly promoted to Associate Professor, earning full Professor in 1978. He remained with the University until his retirement in 1996. Materials in the collection document Peters’ transition from student to professional to faculty member and provide insight into engineering curriculum development and university-industry partnerships. A significant portion of this collection concerns teaching activities and curriculum for engineering courses. Part of Peters’ lasting contribution to ISU was his initiation of an ISU student branch of the Society of Automotive Engineers (ISU SAE) in 1968. The branch’s first year was very successful – earning a personal visit from F. B. Esty, the National President of SAE and culminating in the presentation of a branch charter for formal induction into SAE. Other notable guests of ISU SAE were Phil Myers (former president of the Society of Automotive Engineers), Andy Granatelli (Chief Executive Officer of STP), and Jacques Passino (Director of Ford Motor Company’s Special Products Division). Peters’ love of advising and working with students was recognized multiple times via awards for outstanding teaching and advising. Drawing on both his formal education and experience as an engineer, Peters was an expert in product safety and product liability issues. He published in these areas and taught “moot court” workshops at engineering conferences where participants explored product liability and the law. He also worked as an independent consultant and expert witness specializing in patent infringement, products liability, and failure analysis. One of the special features of this collection is the series of diaries that Peters kept from 1959 to 1969. 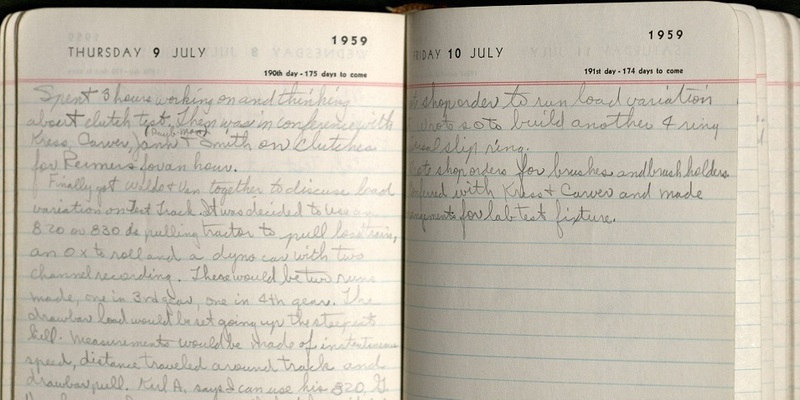 Scattered throughout notes on classes, tough mechanic jobs at John Deere, thesis due dates, and class exams are hints of his rich family life – “Mark’s First Communion (May 8, 1966)” and “Sue’s 7th and 8th graders bought and gave her a bassinett for a going away gift (January 17, 1958).” Peters was devoted to his family and, along with wife (and ISU alumna) Suzanne Gordon Peters, raised nine children. This collection gives us a glimpse into the many facets of a scholar’s life. This collection adds to our steadily growing body of materials on ISU engineering faculty (see Henry M. Black and Anson Marston). Our other engineering collections include: Women in Science and Engineering (WISE), the records of the College of Engineering, and our materials on agricultural engineering and technology. The Leo Charles Peters papers are now available for research (RS 11/10/51) at our reading room on the fourth floor of the Parks Library. Please come by and take a look – there’s a lot more than we can include in a single blog post! October 15th marks the end of a month-long celebration of the many contributions Latino Americans have made to American culture and society. Hispanic Heritage Month (the federally designated name) is celebrated at Iowa State as Latino Heritage Month and recognizes the many people who trace their heritage to the Spanish-speaking countries of Latin America. Founded in 1992, the ISU Latino Heritage Committee organizes campus Heritage Month events every fall. The festivities usually conclude with Noche De Cultura – an event that offers food, music, speakers, and sometimes dancing. This year’s festivities included Marcha de las Banderas, Latino Game Night, and Top Chef Latino. The full array of events for 2014 are available at Iowa State Daily. This photograph, and others from the same event, can be seen in the records of the Office of Multicultural Student Affairs (RS 7/5/1). With RAGBRAI less than a week away, it seems like a perfect time to take a look at bicycle riding at ISU. 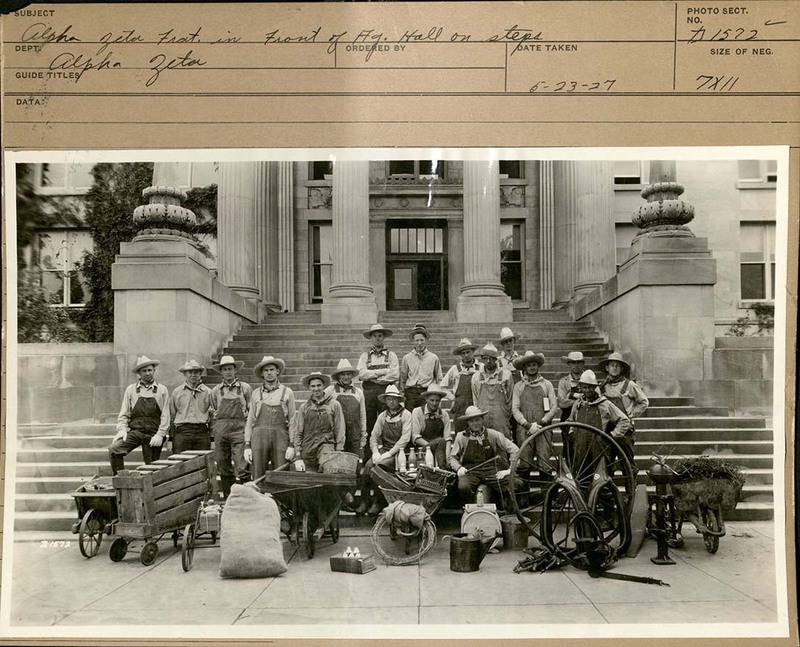 Say hello to these dapper members of the 1898 Bicycle Club of Iowa State College, posing in front of Morrill Hall. 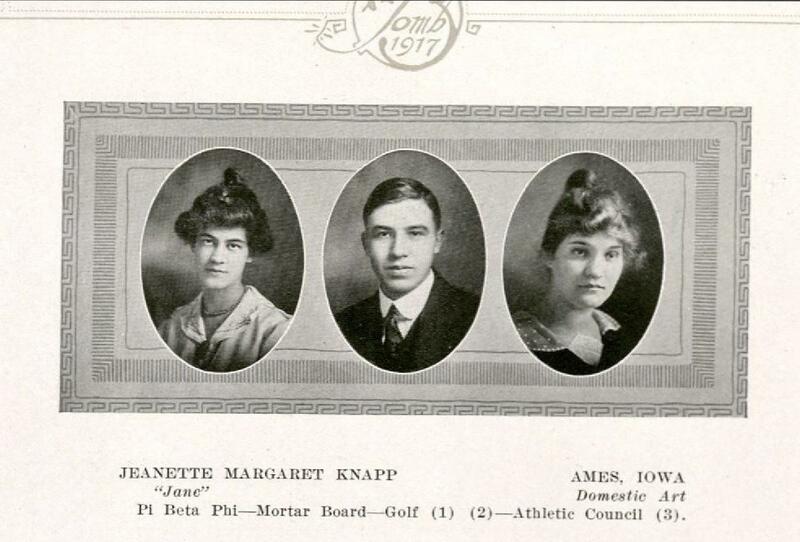 Iowa State College Bicycle Club, 1898. The 1890s saw a bicycle craze in America, with Iowa State students–both men and women–joining in. Makes you want to grab your bike and take it for a spin, doesn’t it? To find out more about other student organizations, check out their collections page, or peddle on over to Special Collections.